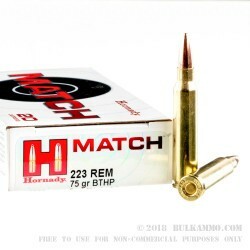 Hornady’s A-MAX match bullets are a great choice for competition shooting, or for anyone who simply wants the highest level of accuracy possible. This .223 Remington cartridge fires a 75 grain boat-tailed hollow point bullet at a muzzle velocity of 2,790 feet per second out of a 24-inch barrel. 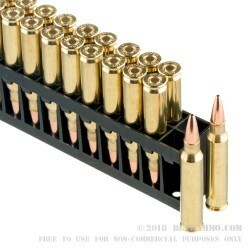 Each box holds 20 rounds in Boxer-primed brass cases. Hornady match ammo competes against some of the best brands in the world to gain the business of competitive shooters. To make its product a strong contender, Hornady uses its finest bullets and hand-selects casings for uniform thickness, weight, and concentricity. Company staff also carefully optimize the powder and primers in each load for best performance. A renowned manufacturer of match, hunting, and antipersonnel bullets since the late 1940s, Hornady of Grand Island, Nebraska entered the loaded ammunition market in the 1990s and quickly found a customer base eager to buy its high-precision products. Hornady ammo is prized by competition shooters, law enforcement officers, CCW holders, and sportsmen around the country. A: Yes, this Hornady match ammo will be very competitive for 600 yard NRA High Power shooting. Q: What is the best rifling rate (ie: 1:9) for heavier bullets like this 75 gr? A: 1/8 or 1/7 twist are preferable for heavier/longer bullets in .223/5.56mm. Q: The .223 is generally not considered a suitable cartridge for hunting mid-size game (deer). 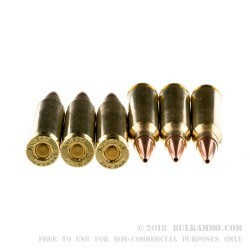 Would the heavier weight bullets like the 75 gr. HPBT, or a polymer tipped bullet with more reliable expansion be exceptions to this convention? A: This Hornady 75gr HPBT ammunition would perform well against deer within 200 yards. However, as it is fragmenting ammunition, small fragments of lead might make their way into the meat - assuming you were harvesting the deer for that purpose, this might not be ideal. Bonded ammunition such as the 62gr Federal Fusion offers increased weight retention and is specifically designed for hunting deer or other light, thin-skinned game.